WACO, Texas (April 10, 2019) – Gospel music takes the pulpit at 2nd & Clay (former St. James Methodist Church) with the fourth annual Voices & Vinyl concert at 7 p.m. Monday, April 15. 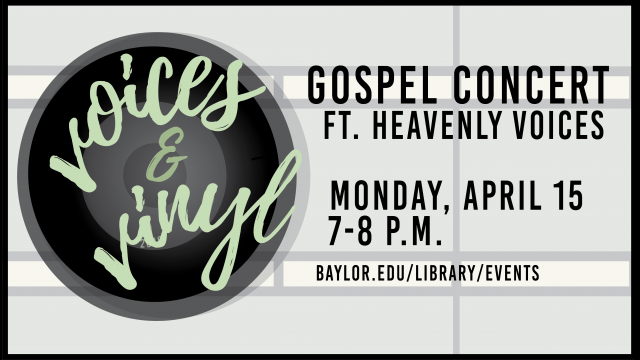 This year’s concert – sponsored by the Baylor University Libraries and its Black Gospel Music Restoration Project, (BGMRP) – will celebrate the “Golden Age of Gospel” music (1945-1975) and its history and impact on the modern music landscape. The event is free and open to the public. The concert will feature songs inspired by the gospel music found in the BGMRP. With more than 3,000 items in the online collection at www.baylor.edu/library/gospel, the BGMRP contains classic gospel songs that date back to the 1940s. A number of the collection’s songs will be remixed and performed at Voices & Vinyl by the Heavenly Voices Gospel Choir. 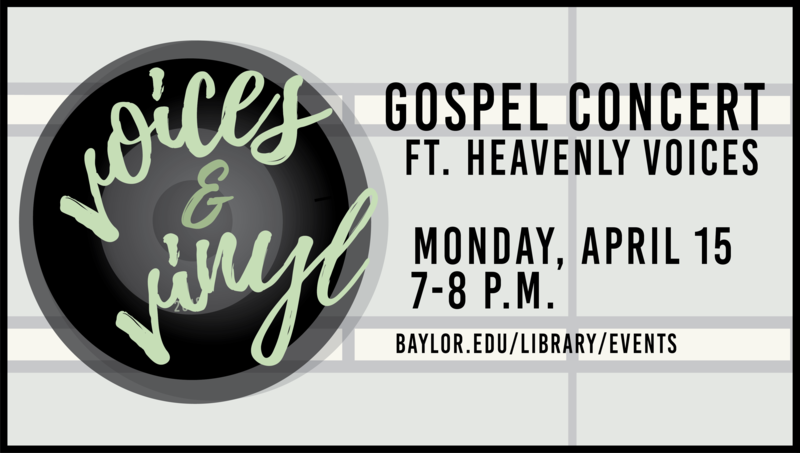 Eric Ames, the outreach liaison for Baylor Digital Collections and coordinator for Voices & Vinyl, credits the group for being able to share classic gospel songs in a way that resonates with today’s audiences. In past years, the concert took place in the foyer of Moody Memorial Library. The decision to change venues was made to encourage community participation and fellowship. 2nd & Clay, once known as St. James Methodist Church, was founded in 1874 by a freed former slave and became one of Waco’s iconic, historic African-American churches, providing a place of spirituality and worship for the African-American community. Today, the building serves as an event venue and provides a perfect location to celebrate gospel music and African-American history. A brief presentation on the history and impact of the Black Gospel Music Restoration Project also will be featured as part of the evening’s lineup. For more information, visit Voices & Vinyl on the Baylor Libraries website or contact Eric Ames at Eric_Ames@baylor.edu or 254-710-1576. Baylor University is a private Christian University and a nationally ranked research institution. The University provides a vibrant campus community for more than 17,000 students by blending interdisciplinary research with an international reputation for educational excellence and a faculty commitment to teaching and scholarship. Chartered in 1845 by the Republic of Texas through the efforts of Baptist pioneers, Baylor is the oldest continually operating University in Texas. Located in Waco, Baylor welcomes students from all 50 states and more than 90 countries to study a broad range of degrees among its 12 nationally recognized academic divisions. The Baylor University Libraries support excellence in teaching and learning, enhance research and discovery and foster scholarship and success. Through its Central Libraries and special collections – Armstrong Browning Library, W. R. Poage Legislative Library, The Texas Collection and The Keston Center for Religion, Politics and Society – the Libraries serve as academic life centers that create knowledge through research resources and innovative technologies that empower the Baylor community and enrich academic conversations around the world.